Many furry conventions, including Eurofurence and Confuzzled, take pride in their Pawpet Show. So does Golden Leaves Con. Since our second run in 2011, we've had our own brand of quirky puppetry entertainment going on. The Pawet Show (in German language) takes our prime-time slot on Friday and is considered by many a highlight of the convention. 16 volunteers are part of Fendracus's "Swiss Pawpeteers" team. They write the script, create the backdrops and props, or come up with special effects. And of course they perform live for the audience. All puppets are skillfully hand-crafted for the purpose, and new ones are added every year. Our Pawpet Show's comedy-infused adventures are starting to get noticed across the borders. 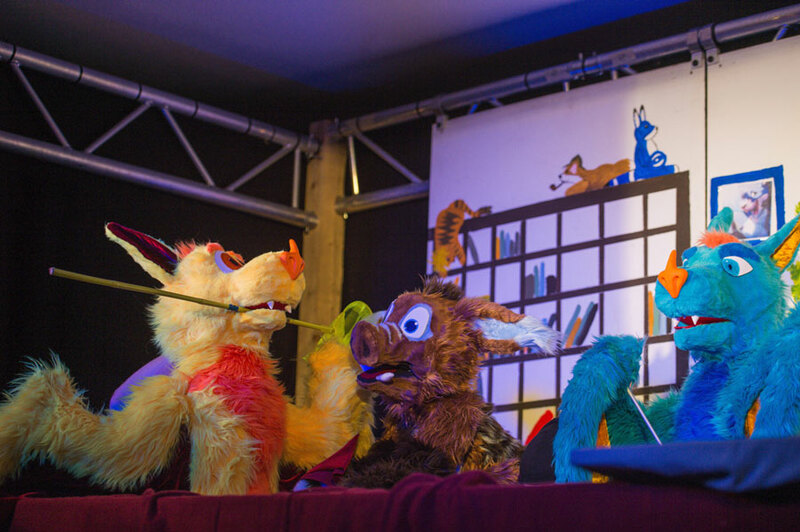 In 2015, the Swiss Pawpeteers had a memorable guest performance at Eurofurence, playing their piece "Ottopia" on the big stage.